Delectable tubular pasta that has the shape of a rooster comb, this Creste di Gallo is from pasta maker Marella. Originally, this pasta was a type of fresh stuffed pasta like ravioli with the same shape as it does now. However, brilliant artisans from Marella have created this outstanding dry pasta version for pasta enthusiasts. 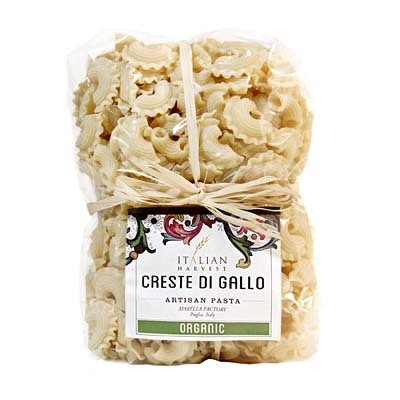 How to cook this dry organic pasta? Same as with other pasta, boil in water until it becomes al dente, and then serve with you favorite pasta sauce. Got serious pasta cravings now? Cook some of this yummy pasta today and satisfy those cravings! Buon appetito!